The restoration of one of the most romantic and unspoilt small manor houses in the Cotswolds, Grade II*-listed Bradley Court at Wotton-under-Edge, near Stroud, Gloucestershire, has been a 30-year labour of love for acclaimed furniture designer Thomas Messel and his artist wife, Pepe. But now, with other horizons in view, the couple have called time on their Cotswold adventure, and a rejuvenated Bradley Court will be launched on the market in next week’s Country Life, at a guide price of £3 million through Jackson-Stops & Staff (01285 653334). As the nephew of the late Oliver Messel, the iconic theatre designer, and the cousin of the Earl of Snowdon, a passion for original design and a feeling for beautiful things have always been part of life for Mr Messel, who grew up at stately Nymans, West Sussex, the Messel family home now owned by the National Trust. He and his wife were living there in February 1982 when Lord Snowdon heard that his friends Adrian and Polly Garnett, the then owners of Bradley Court, were thinking of selling, and advised the young Messels to rush to the Cotswolds. They were instantly captivated by the stone and brick-built manor on the edge of the Cotswold escarpment, which, although ‘tired and shabby’, appeared to ‘grow out of the ground’ in the way that only ancient Cotswold houses seem to do. A deal was struck over tea and, by October of that year, the couple was installed and raring to restore. Although there was a Saxon manor at Bradley at the time of Domesday, the present Bradley Court was built for Edward and Elizabeth Berkeley in 1559, using stone from the older manor house and possibly some taken from nearby Kingswood Abbey, which was demolished after the Dissolution in 1536. In 1692, the estate was bought by Thomas Dawes, a wealthy Bristol cloth merchant and twice mayor of Wotton, who laid out the gardens in front of the 16th-century south front, as depicted in the Johannes Kip engraving of Bradley Court in Sir Robert Atkyns’s Ancient and Present State of Gloucestershire, published in 1712. That 18th-century engraving was to provide the inspiration for the intensive repair and renovation of the entire house, undertaken, as Mr Messel reveals, ‘because we reckoned that if we didn’t do it properly, nobody else would’. Having said that, in addition to their own boundless energy and enthusiasm, they did have an impressive array of knowledgeable friends, relatives and conservation experts to call upon. Among them was Lord Snowdon, of course, who advised opening up the kitchen to its present substantial proportions, and the late James Lees-Milne of the National Trust, who identified Gloucester architect Anthony Keck as the likely designer of the Georgian drawing-room wing, with its 14ft-high ceilings and huge windows, added in about 1790. An article by the architectural writer Jeremy Musson (Country Life, September 15, 2005) traces the evolution of this ambitious undertaking, overseen throughout by Rory Young, which has seen the ‘handsome, well-shaped, many-gabled house’ regain its 16th-century authenticity while taking on the uniquely warm yet elegant ambience that is the Messel trademark. This has been achieved in many subtle ways, notably by stripping out extraneous elements such as the 19th-century service entrance to the south, thereby restoring the north elevation to its original character and allowing more light into the original kitchen. A Victorian lead bathroom was also removed, as was a 19th-century corridor dividing the first-floor bedrooms, which returned that floor to its 16th-century plan, with each of the main bedrooms having its own turret staircase. Bradley Court now has four main reception rooms, a large kitchen/breakfast room, five main bedrooms, three bathrooms, two/three secondary bedrooms and a further bathroom. Additional buildings include a coach house with two staff flats, and some 3,000sq ft of outbuildings with planning consent for redevelopment, including a stable block that presently houses Mr Messel’s studio and workshop. The remodelling of Bradley Court’s nine acres of gardens and grounds to restore the spirit of the compartmented gardens in the Kip engraving was master-minded by Mrs Messel, and includes a formal knot garden to the south. To the west, in front of the Grade II-listed gazebo, is a sunken croquet lawn with ha-ha walls. To the north is a formal tree-lined walk with a large lawn, with an arboretum on one side, and, on the other, a wilderness garden planted with specimen trees and rare shrubs. 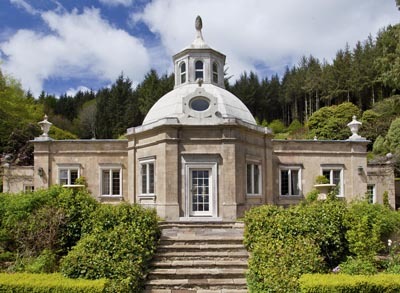 It’s hard to imagine a more perfect integration of an 18th-century architectural gem within its garden setting than that of Georgian, Grade II*-listed The Orangery at Mamhead, near Exeter, Devon. According to its English Heritage listing, it was built in the Classical style in about 1740 for Thomas Ball, owner at the time of the surrounding Mamhead House estate and ‘a great planter and sylviculturist’, according to Christopher Hussey, the country-house historian and former architectural editor of Country Life. Hussey suggests that The Orangery may have been inspired by Archer’s Water House at Chatsworth, and may even have had a cascade descending from it, as designs for improvements at Old Mamhead by Robert Adam in 1769 are said to include a drawing for the conversion of a water house to a temple and refer to this building. Set in 60 acres of 18th-century landscape designed by Capability Brown, The Orangery-refurb-ished and extended by successive owners in the past 40 years-stands on rising ground to the west of Mamhead House, with magnificent views framed by cedar trees looking eastwards towards the Exe Estuary and Lyme Bay. For the past 16 years, the renovation of the neat, historic building, its grounds and gardens, has been a fascinating ‘work in progress’ for its owners, Sir Malcolm and Lady Field, who bought the house in 1996. Lady Field, a former interior designer-turned-artist and sculptor, has concentrated her considerable talents on restoring and improving the house, with the help of historic-house designer Chris Daniels. Her husband has overseen the redesign of the gardens by Georgia Langton, with the creation of woodland walks and a romantic hidden lake. The classic sobriety of The Orangery’s Georgian façade belies the light and colour of the interior, where lofty ceiling heights, mullion windows, open fireplaces and stone floorings emphasise the bright and spacious feel of the house. Of particular note are the cool, elegant drawing room, the relaxed, book-lined Blue Room and the domed pink dining room leading to the stone terrace overlooking the park and the open sea. In addition to the three main reception rooms there is a large kitchen/breakfast room and four bedroom suites, with a further two bedrooms available in the enchanting wooden boathouse down by the lake. Knight Frank (020-7629 8171) quote a guide price of £3 million.